Star Trek: "Errand Of Mercy" / "The Alternative Factor"
"Errand Of Mercy" / "The Alternative Factor" / "Errand Of Mercy" / "The Alternative Factor"
"Errand Of Mercy" / "The Alternative Factor"
The first season of Star Trek is nearly thirty episodes long. We're in the home stretch now, and while it's probably going too far to say the seams are starting to show (especially considering that the best episode of the season, and quite possibly the show, is yet to come), certain patterns have definitely emerged. We've talked about the God Being mechanic, and it comes up again in the first episode of the week, "Errand Of Mercy." "Errand" also gives us another warlike race with a leader who can't help admiring Kirk as much as he'd like to kill him. 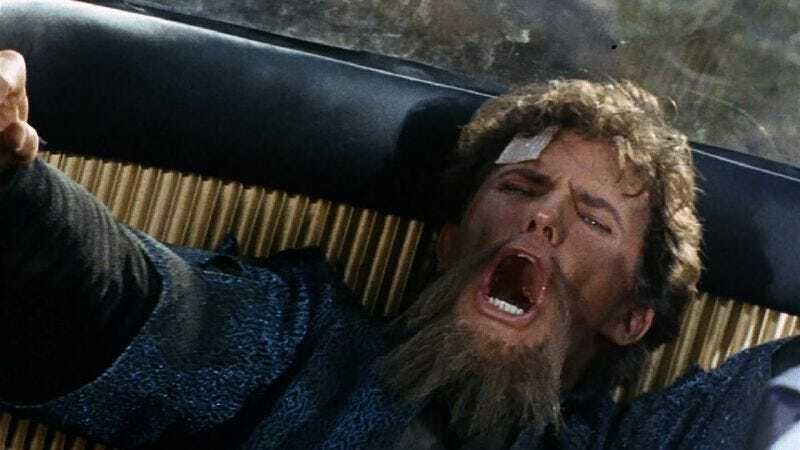 The original Trek, for all its lofty humanist intentions, was mostly pure pulp, and pulp isn't generally known for the shocking originality of its ideas. Energy, yeah, pacing, sexiness, action, adventure, two-fisted heroes, all that stuff, sure, that's why we love it. But you have to accept that, given enough of it, you'll end up re-treading a lot of ground. We open, as is often the case, on the Enterprise bridge; after an info dump explaining that Starfleet's negotiations with the Klingons have broken down, and that the nearby world Organia offers the turning-out-to-be-enemies a perfect location to set up base camp in case of war, the Enterprise is attacked. Due to budgetary constraints, it's a short battle, and we don't even see the other ship—just an exchange of fire, and Sulu's confirmation that their attacker is completely destroyed in the melee. It's a hollow, kind of pointless moment, over before you're even aware it started. But at least it's quick. Soon as the battle is won, the message comes in from Starfleet—it's Code One. War has been declared. That means Organia has gone from theoretical talking point to crucial military target, so the Enterprise beats feet (or interstellar equivalent) to the planet, where Kirk and Spock beam down, leaving Sulu in charge. Kirk gives Sulu specific orders: if the Klingons show up, assess the danger, and if it's a whole fleet, get the hell gone. As always, the Kirk's ship (and the people on it) take precedence over Kirk's life. It also means that, when the inevitable fleet does arrive, Kirk and Spock will be stranded below. Otherwise, we wouldn't really have a middle act. The Organians are supposed to be peaceful, friendly, and quite primitive, even by our standards. Upon arrival, Kirk and Spock are welcomed by a friendly gentleman named Ayelborne; he takes them to see the Council of Elders. While Spock does some wandering, Kirk makes his pitch—the Klingons are nasty sons of guns, and the council, and all the people on the planet, are in grave danger. They need to be prepared to defend themselves (shades of the Vietnam war here, with America wanting to protect South Vietnam from invading Commies), and Kirk—and Starfleet—want to help. One of the things that makes this sequence, and others in the episode like it, so fascinating is how Kirk seems a little two-faced in his pleas. There's no doubt that he believes that the Organians will be harmed by the Klingons, but he doesn't make much mention of how important the planet is to his side in terms of the whole war. Failing to acknowledge that makes his increasingly desperate encouragements just a little bit awkward. But whatever his motives may be, he does want to help, and he does have a point. So why are the Organians so obstinate in their pacificism? Like "Arena" before it, "Errand" is a combo episode, mixing two standard Trek plotlines in order to fill out the hour; here it's "fighting the evil aliens" and "investigating a place where nothing seems to make much sense." Until the Klingons arrive, we're heavy into the latter plot, with Spock discovering that the whole race seems to be a textbook example of an arrested culture, with no apparent developments or innovations made in thousands of years. Plus there's the Council's baffling calm in the face of armageddon. It's an intriguing set-up, even if the resolution is predictable, and one of the things that makes it work better than it should is that the mystery isn't resolved for a while. Kirk is less mystified than frustrated by what's going on, and once Kor shows up, he gets so caught up in fighting back that he forgets to concern himself with anything else. It's a small thing, but as structural tweaks go, an effective one. As for the Klingons themselves? Not bad, and Kor is certainly fun, but it would be a while before they'd develop to real iconic status. Once they beam down to the planet, they immediately take control of the main city, and Kor starts issuing a list of ordinances that must be followed on pain of death. One nice touch is that Kor shares Kirk's growing contempt for the non-violent Organians; Kirk initially poses as a native of the planet, but Kor quickly recognizes him as a like mind, at least in terms of backbone. Spock claims to be a Vulcan merchant, which doesn't go over all that well—Kor has him sent to the "truth finder," a nifty device that can read a man's mind, or empty it, if one were so inclined. Spock being Spock, he can defend himself against the machine's invasions, but dramatic law should dictate that Kirk find himself faced with the thing at some point. Only he never does. We never even see the machine; Kor uses it as a threat later in the episode, but he never follows through. The most exciting aspect of "Errand" is Kirk's abortive attempts to start a revolution against the Klingon opressors. Again, we have to wonder at what's driving him—while the Klingon law is obviously harsh, Kirk and Spock seem the only people in the area even remotely bothered by it. And the Klingons don't start executing the locals till after Kirk and Spock start mucking around. There's a certain arrogance to our captain's actions that fits well with the final reveal; he's decided he knows what's right, and by god, he's going to make sure that's what happens. He and Kor even bond over how much they dislike the Organians and they're refusal to get involved—sure, they're both enemies to the death and all, but at least they plan to go down fighting. Why even bother having other species around if you aren't going to try and kill 'em at some point? Turns out that the Organians aren't actually cowards; they're energy beings so far advanced beyond our own limited capacity that the very act of interacting with Kirk and Kor actually "disgusts" them. (Which begs the question, why get involved at all? Why set up an entire illusory town, full of fake people to get fake killed, when you can barely stand to deal with these savages?) They've decided that this whole war thing is very silly, and they're going to put an end to it; which they do by making all the weapons on the planet, and in space, too hot to handle. (Cute, that.) Kor and Kirk get upset—after all, what right do the Organians have to decide the fates of others? But no matter, what's done is done, and we're probably better off in the long run for it. And hey, the big flowing light guys disappear at the end, so there's no reason we can't fight tomorrow. "Errand" is fun (and the usual Kirk/Spock dynamic is in fine form), but in some ways it's a case of missed opportunities. There are logical holes throughout (given that the Klingons were due to arrive at any minute, Kirk's plan to just beam himself and Spock to the planet to rile up the locals seems ill-advised, especially since the locals didn't have the tech to combat the Klingons; did he just expect them to throw rocks? ), but the biggest problem is the cop-out ending. While it's nice to see Kirk forced to confront his own failings for once, having the whole thing turn out to be a game with no consequences feels more than a little cheap. It would've been stronger (and admittedly harder to write) if the Organians really had been what they appeared to be—just some nice folks who don't want to get mixed up in all the craziness. Whatever it's flaws, though, at least it makes sense. The same can't really be said for "The Alternative Factor," a fifty minute long struggle to get a square peg into a round hole—something like your eye socket—that represents the bottom of the barrel for the series this far. You can say it has ambition, and maybe it does; after all, the Enterprise is battling against cosmic forces that put this universe and in the next in harm's way. Problem is, the only real impression this ep gives is of a handful of half-ideas so undercooked that most of them are still mooing. Or clucking, or snarfing, or whatever the hell sound ideas make before you burn 'em alive. Kirk and the crew are doing a routine investigation of another uncharted planet when an Effect hits, freaking everyone out and throwing the bridge into confusion. The Effect is just some static shocks of a starfield super-imposed over footage of our heroes; it'll get more involved later on, but expect to get really, really sick of it before the episode's conclusion. Word comes in from Starfleet that the Effect spanned the galaxy, although it appears to have been strongest coming from the planet the Enterprise is orbiting. Order are to investigate what the hell is going on; so it's a good thing that a life form suddenly appeared on the previously lifeless planet below, or else there wouldn't be anyone around to investigate. Kirk beams down with a team, and they find a mini-flying saucer ship, and a crazy dude called Lazarus. Lazarus is upset, and he will continue to be upset throughout the ep. Except for those times in which he isn't upset, but he's not really himself then, so those hardly count. Laz passes out before Kirk can get much out of him, and it's back to the Enterprise, where we dump the new guy in Sick Bay (off-screen) and Spock and Kirk try and figure out just what the hell is going on. Here's where we run into one of "Factor"'s biggest problems, in that everybody is constantly telling us things we've already figured out, in slightly different ways. So this Effect, right? It's the universe winking out. And it's centered over the planet. And right after it happened, Lazarus showed up. Don't forget, the Effect is strongest in this area. The area with Lazarus. The area that Lazarus wasn't in before the Effect, but now is, or was when they found him. I wonder if the two are connected? What's even more frustrating is that for all this repeated information, there seems to be precious few hard facts flying around. Kirk demands Lazarus give him answers, but the guy just rattles about some monster that has to be destroyed, demanding Kirk use the Enterprise's resources to help him. Of course, we eventually find out that Lazarus has a good reason for not explaining himself, being just as crazy as he appears to be, and even more dangerous. But to get to that point means wading through an awful lot of circuitous dialogue, circuitous action, and the endless replays of the Effect, now with added bonus footage of two men struggling against each other in what looks like reversed-negative film. That sounds like it should be cool, and the first couple of times it kind of is, but then it keeps happening—and it always runs too long. Red-shirt: Is that an order Lieutenant? Masters: I know what you mean. Well, I'm glad somebody does. We get a scene with Kirk and McCoy that introduces one of "Factor"'s big clues—the fact that Lazarus had a head wound when he was brought to the doctor, but after another dose of the Effect, the wound had vanished. The cut, and the bandage that goes on top of it, will disappear and reappear throughout the remainder of the show; it's not a continuity error, but an indication that crazy Lazarus has been replaced with another guy who looks just like him, but is sane. The best I can parse it—and this is baffling, unrewarding crap right here, like trying to figure out the Final Five's history on Battlestar Galactica if the show had been created by Albert Pyun—is that crazy Lazarus used to be a happy guy, and then some sciencey thing happened, and he found out that he had an anti-matter twin. (Oh yeah, the sane dude is anti-matter.) The idea that he could have a duplicate drove him crazy, so he decided to track the guy down and kill him. Only thing is, if the two of them are ever in the same universe at the same time, both universes will go kerblooey. It sort of almost makes sense, if you ignore the ramblings about a destroyed world; Crazy Lazarus claims that his flying saucer ship is actually a time ship, and he's from some other when, but it's hard to trust a guy who sweats that much. What really kills this episode is the pacing; a lot of time is spent wandering around, and we don't get the real truth of things (such as it is) till the last ten minutes, when Kirk inadvertently gets sucked into one of Lazarus's inter-dimensional thingamajigs and meets Sane Lazarus, who explains what I've already explained above. It's not really a terrible idea—finding out that the guy who we thought was the hero is actually a nutter can be fun—but the execution and timing are lacking. Sane Lazarus convinces Kirk to help him trap the crazy one in the "safety valve" passage between the matter and anti-matter dimensions, and when Kirk comes back to our universe, he does just that, fighting with Crazy Lazarus just long enough to shove him into his own trap. (Note how Spock and the security detail just watch this without trying to help or intervene.) Another a cool idea: both Lazaruses (Lazari?) are trapped forever between dimensions, doomed to struggle for all eternity, or else until they starve to death. In a stronger episode, that could've meant something. Spock: And what of Lazarus? Kirk: And what of Lazarus. 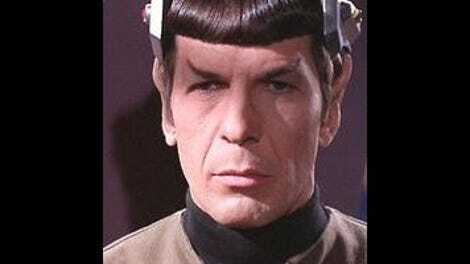 Spock: There is, of course, no escape for them, sir. Kirk: There is, of course, no escape. Kirk: But what of Lazarus? What of Lazarus. In a possible bit of continuity, Starfleet issues another Code One during "Factor," warning of invasion. Next week, "City On The Edge Of Forever" and "Operation—Annihilate!"